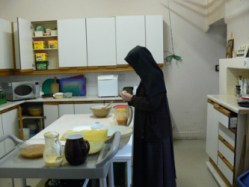 What is the basic structure of a Carmelite nun's day? 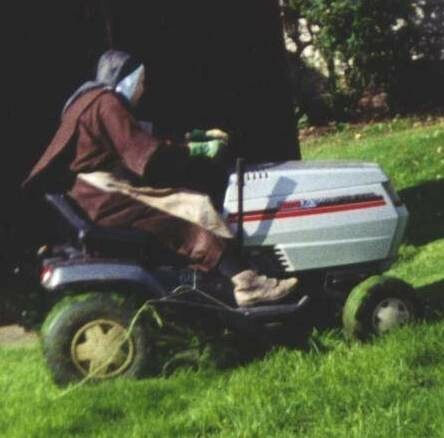 As stated in our Constitutions, the horarium is to keep the faithful balance, which St. Teresa wanted, among the hours of prayer, work, and rest, as well as harmony between times of solitude and of community acts. 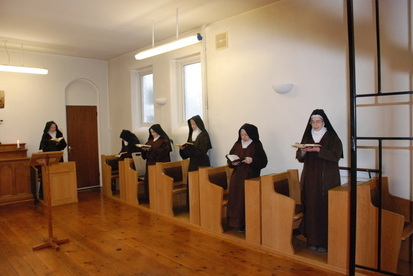 After rising at 5.30 a.m., the daily life of a Carmelite is made up of times of prayer, spiritual reading, work, meals, recreation and rest. PRAYER - All the sisters take part every day in the celebration of the Eucharist, which is the source and summit of the life of the Church, a sign of unity and bond of charity. 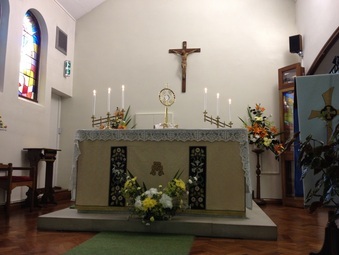 They also celebrate in common all the hours of the Liturgy of the Hours - which comprise Morning Prayer (Lauds), the Office of Readings, the three middle hours of Terce, Sext and None, Evening Prayer (Vespers), and Night Prayer (Compline) - in accord with the norms of the Church. Each community represents, in a special way, the Church at prayer and joins itself to the unceasing praise and supplications which Christ offers to the Father for the salvation of the whole world. This participation in the prayer of Christ is prolonged during the day in personal prayer, whether in choir or while going about their daily duties. In compliance with Teresian tradition, the sisters spend two hours daily meditating in common. This silent personal prayer usually takes place in choir, one hour early in the morning and the other in the evening. 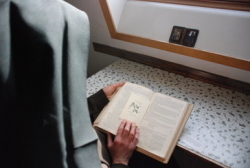 SPIRITUAL READING - The nuns dedicate about an hour each day to spiritual reading and aim to keep the word of the Lord continuously in their minds and hearts, for progress in the life of prayer is not possible without sufficient knowledge of God's word. As well studying and meditating on the Scriptures, they nourish themselves with the works of the Church fathers, with the documents of the Magisterium, with the writings of the saints and other authors of our Order, especially Saint Teresa of Jesus and Saint John of the Cross, and with other theological and spiritual books. WORK - In imitation of Christ who wanted to work with His own hands in Nazareth, and in obedience to the prescriptions of the Rule, the nuns submit themselves gladly to the common law of work, earning by toil the necessities of life. They place at the service of the sisters their energies and talents, keeping in mind that labour is also a way to associate themselves with the redemptive work of Christ. Work in Carmel takes on many forms: housework, sewing, gardening, cooking, etc. and earning one's living (maybe by making and selling altar breads, Mass vestments or greeting cards). There are about two and a half hours allocated for work in the morning and the same in the afternoon. MEALS - The sisters joyfully take their meals together with gratitude to God who is the giver of gifts and who blesses the work of their hands. During meals, in keeping with the Rule, they normally listen to a reading from the Bible, or other useful readings. The food is generally plain, but adequate and nourishing. In conformity with Carmel's spirit of penance and austerity, from the feast of the Exaltation of the Holy Cross until Easter Sunday, the fast prescribed by the Rule is observed. The sisters also faithfully abstain from meat, except in case of need. 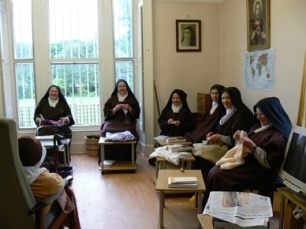 RECREATION - So that the sisters may joyfully and spontaneously communicate with one another, recreation is held in common, according to the mind of Holy Mother, twice a day - after dinner and after supper. This is a time for the community to chat and relax together over light work and for the Prioress to pass on any news or requests for prayers. On certain festive occasions it may take the form of some special entertainment, perhaps musical or theatrical. REST - In accordance with the Teresian tradition, about seven hours are given to rest at night. The community usually retires about 10 p.m., the 'great' silence prescribed by the Rule being faithfully observed from after Night Prayer until the end of Morning Prayer the next day. However, there may also be a quiet period during the day to allow any sick or elderly sisters the option of additional time to rest.